You might be used to comparison shopping between different brands when looking for a new TV. However, you should also compare your options from one brand, especially if you find a brand that you really like. This will help you to figure out which model best suits your needs. One great option is to compare Vizio television series amongst themselves. 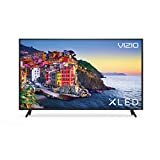 Vizio is a top name in televisions, so you can expect to get quality, well-made products. In addition, you get the peace of mind of choosing a respected name brand. This brand has a variety of different lines of televisions, which they refer to as a series. Each series will usually feature several different sizes and is distinguished by the features the TVs in the series have. Today, we will take a look at two of the top series being offered by the brand: E and M. First, we will tell you about each series, and then we will make a comparison of the Vizio E series vs. M series to give you a better idea of how they measure up to each other. This should help you to figure out which series offers the television you would rather buy. The Vizio E series comes in sizes ranging from 43 inches to 75 inches. They cost from $349.99 to $1,399.99. The televisions in this series are all 4K HDR Smart TVs. They feature Active Full Array and run on the SmartCast operating system. You can control these televisions using your voice with Alexa from Amazon or Google Assistant. Additionally, Google Chromecast is built into the TV. Looking more into the specifications, you will find this series has UltraBright 400 to enhance brightness. Over eight million pixels means sharper images and better overall clarity. The resolution is 3840 x 2160, giving you four times more detail than full HD. Contrast is given a boost thanks to Dolby Vision. The TVs also support HDR. The backlight has up to 16 local dimming zones to provide a more vibrant picture that adjusts lighting for perfect blacks and brighter whites. You can also expect Ultra HD enhancement for HD and full HD content, along with a stable picture and reduced blur. The 120 Hz effective refresh rate helps ensure a smoother and more consistent picture. Since the E series are smart TVs, you also want to be sure this aspect will stand up and produce results. Thanks to the Octa-core processor, you get speeds that are super-fast and able to handle complex tasks easily. The SmartCast OS offers many app options and gets updates automatically. You can also download the Vizio SmartCast mobile app to find new content and control your TV. Beyond watching content, you can also do many additional tasks with your TV, including the following. These are fairly standard features of smart TVs, so you may want to pay attention to the quality of how these tasks are handled. With this TV series, the quality is pretty good. You should find it easy to use the different multi-device features. When looking critically at the E series, we see that the built-in operating system is a bit lacking. Other streaming services do a better job and offer more apps. However, these TVs have great picture quality and really do deliver on value. The main issue with the smart TV features is that you need to use your phone to access streaming services, such as Netflix. The company has promised an update to fix this, but until then, it can be a hassle. In addition, there is an on-screen menu to stream some apps, but the whole process can be a little confusing and bulky when other TVs offer everything right on the TV without having to use your mobile device. Here's the thing with SmartCast. Pretty much all competitors integrate a streaming service or have an operating system interface where you can download new apps from an app store. You can also customize the display. Everything is done on the TV through the remote. With SmartCast, you are completely operating from the app you have to download on your mobile. It can be limiting and is not something that will sit well with some consumers. Of course, most people are most concerned with the picture quality. The larger screen sizes do the best in this series. Expect the local dimming to produce deep blacks and great contrast. These TVs also have exceptional color and uniformity across the screen. They work best in darker rooms. You will notice in brighter spaces they may not look as good. In addition, the HDR quality is not the best. Moving on to look at the Vizio M series, you will find these come in sizes ranging from 55 inches to 70 inches. Prices run from $699.99 to $1,299.99. They use 4K technology with UltraBright 600 and Active Full Array Plus. They are also smart TVs, using the SmartCast operating system. Voice technology is compatible with Amazon Alexa or Google Assistant. Google Chromecast is also built in. Another notable feature is the bezel-less screen design. When it comes to your experience, you can expect 4k Ultra HD that provides a clear and vivid picture quality. It is also HDR compatible. Dolby Vision helps produce deep blacks and great contrast. Brightness is given a kick with UltraBright 600. This is backed up with the 40 local dimming zones that help make contrast excellent. These TVs handle scaling HD content to Ultra HD with the spatial scaling engine. In addition, you won't experience blurs, and you'll get the smoothest picture ever thanks to Clear Action 360 and the 120 Hz effective refresh rate. The picture quality looks more natural and focused. Looking at the specifications and actual operation of the M series televisions, the thing that stands out is the image quality and overall value. At this price point, you are getting a lot for your dollar. The image quality is really on par with what you would expect from a 4K TV. It does great with brightness and blacks, offering a clear picture. The smart TV features also work great and are easy to use. This TV does fall short if you are looking to cut the cord. The streaming aspects are difficult to use and not really comparable to competitors. There aren't a lot of apps on your on-screen menu, and you cannot add more. You can use your phone to stream from, but that is a hassle when so many others offer the ability to do it all on your TV. As mentioned, though, the picture quality is amazing. It produces very clear and sharp images with excellent color. The dimming helps with uniformity as well. You get deeper blacks and whiter whites for colors and contrasts that pop. However, it does have some issues with accuracy and blurring. When it comes to inputs, the M series is doing great. It has a hook up to add an antenna, which is important if you get your local channels over the air. Connections also include the following. All inputs will run 4K, which is good news if you buy this TV specifically for the 4K properties. Now to make a side-by-side comparison of these two series to help you spot similarities and differences. As we looked over each series, we noticed there was one main difference. Almost everything else between the two was fairly identical. Here is the rundown of each series' specifications. We want to go over the different features and specifications to give you a simple list format. Here's a quick look at how these series stack up. If you want good picture quality and overall value, you can't go wrong with a TV from either series. Both are 4K. This means they have the best resolution that is currently available on the market. All other top TV brands are also using 4K, so it is becoming more standard as a feature. It doesn't really make these stand out, but it is a feature that many people look for when buying a television. They also both have the various features to sharpen images, provide great contrast and produce clear colors. These options, again, are pretty standard, but it all comes down to how well they do it. Both series are pretty much in line with the quality of image customization. They both usually need some adjustment during initial setup. However, this is completely normal as factory settings are often not acceptable because they don't take your viewing atmosphere into consideration. They both run off an octa-core processor. The processor is important because they are both smart TVs. When you have a TV that has computer-like capabilities, it needs a good processor just like a computer. If the processor is too slow, then it will result in choppiness and overall issues with speed. Finally, they are both HDR compatible and both provide scaling for HD and Full HD content to make it show in 4K. These are all important as technology advances. They may be more important to some people than to others because some programming is not yet available in the full HD format. However, if you are watching something in regular HD and your TV lacks scaling, it won't look that great and could be missing pixels. Now to look at the differences and where these two series really start to show things that can help you decide on one over the other. When it comes to picture quality, the E series has fewer of the dimming zones to help with contrast, brightness and black levels. The E series only has 16 whereas the M series has 40. This will make some difference in image quality if you are focused on contrast. It can also bring about issues with viewing in very dark or very bright rooms. It really depends on what the area is like where you will put your TV. For some people, this may have little effect, but for others, it may be a very important point to pay attention to in order to ensure a quality viewing experience. The biggest difference to note is that the E series lacks the ability to connect an antenna. This can be a huge issue for many consumers. If you need to access over the air channels, you cannot do it with any television from the E series. The M series, however, added this feature back, which gives it a slight leg up when it comes to comparing the two. However, if you don't use an antenna, then you may not really care either way. Still, you should consider this when making your decision. You never know what you may want in the future. It may be better to have the option and not use it than to need it later and not have the option. So, weigh this point carefully. One final difference that may play into your decision is that you will see that the E series comes in smaller and larger sizes, ranging from 43 inches to 75 inches, while the M series is limited to 55 inches to 70 inches. While the price range for the M series starts at a higher amount, that just reflects these size differences. Price-wise these series are very comparable overall, so that is not really affected. The main point depends on whether you want a size not offered in a specific series. Again, though, you may want to worry about this after considering other factors just to ensure that you end up with the best set. Compromising on inches a little usually won't bother your viewing as much as compromising on other aspects. One neutral aspect worth mentioning is that both have the same smart TV features, which are a little lacking. People typically expect a smart TV to have the streaming built in and not need something external to get apps and play content. However, Vizio did not build this in. There are promises for updates to the SmartCast software that will allow for a more user-friendly platform, but these have not been introduced yet nor has there been anything more than promises to show Vizio is moving ahead with this update. So, unless you like using your phone to control your TV, you should get some sort of external streaming device, such as Roku or Amazon Fire. When looking over both the E series and the M series, the M series seems to have the edge. One of the main selling points is when it comes to connectivity. Many people buy a smart TV because they don't want to hook up to cable or satellite and wish to use streaming services. However, there is limited access to local channels through streaming, so most people are still using antennas to access these channels. The M series allows you to do this, but the E series lacks the antenna hook up. That can be a deal breaker. Furthermore, the M series slightly edges out the E series when it comes to overall picture quality because it has more dimming zones to really punch up that contrast.